Retrace the history of your favorite squad through beautifully reprinted coverage from the The New York Times. Tip off to buzzer beater, nothing thrills the basketball buff like cheering on their home team from the stands. 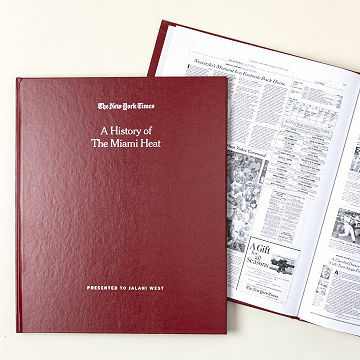 Take the excitement home with this personalized book that retraces the history of your favorite NBA team through beautifully reprinted coverage from The New York Times archives. As you flip through celebrated moments, you'll relive glory days, newsworthy games, and get to know the all-star cast of ballers. The winning collection of full-size facsimiles is preserved in a handsome library binding and can be embossed with a name, for a personal touch. Made in Williston, Vermont. Please note: Cover color is determined according to team colors. The New York Times Custom Baseball Book goes back to each team's early years (in some cases to when the team was created!). All books are at least 70 pages in length. These pages are not standard newspaper dimensions, therefore, the type is shrunk slightly to fit a more convenient, book-sized trim. Certain years/pages are reprinted from microfilm and font size may be reduced. New pages may not be available for inclusion for up to 6 months after the date of print. Missing pages may be the result of a newspaper strike or a lack of relevant information on the front page for that date. We'll definitely be reading it over the next couple months. It will definitely be a coffee table book for us! It was bigger than I thought and everything was so clean and fancy. Definitely Ann original gift anyone who loves basketball would love. Such a cool gift. So many have asked where I've got it from and what an awesome idea it is. Also, aesthetically pleasing! Overall, great. I got this for my father, who is a die hard Celtics fan. I had never seen a book like this and don't believe he has either. Such a special gift. This was so meaningful to my husband.